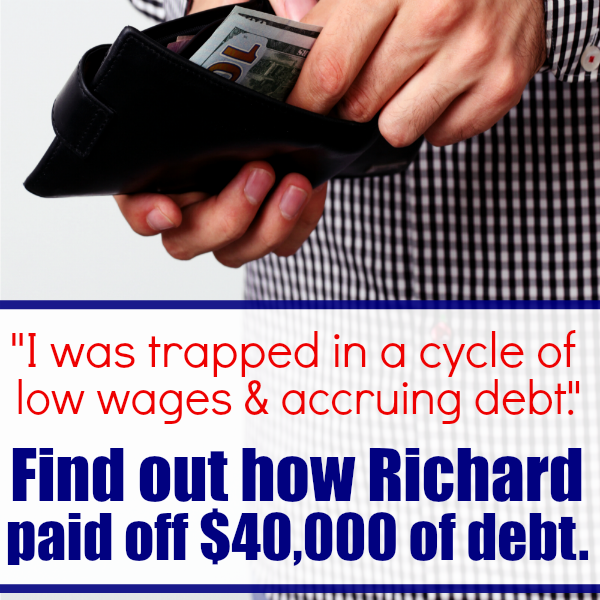 Find out how Richard paid off $40,000 of debt. Today’s Debt Free Story is from Richard of Frugality Magazine, where he shares frugal living tips for financial freedom. I’m a British reader, based down on the south coast. Broadly speaking my biggest passions revolve around nature and the outdoors. So whether that’s hiking across the beautiful Sussex Downs, growing my own vegetables or taking my binoculars out for a spot of bird watching I rarely spend much time indoors. Of course, the British climate isn’t always kind, but I’m pleased to say the weather recently has been glorious and I’ve been making full use of it! Career-wise while I studied biology at university I came out to find very few opportunities in my field. I sort of fell into a retail job just to make ends meet while I figured out what to do, only to find myself “typecast” into this role for the next 10 years, moving from one demanding position to another. These days, I’m pleased to say, I have moved on, and now work in a marketing role – enjoying far more civilized working hours. In total I estimate I paid off round $40,000 worth of debt, though depressingly a fair chunk of that was just interest. I left university, as so many do, with a fair chunk of debt. However, working in retail as I did, I was never a “big earner”. While I tried to repay my student debt, the small payments I could afford made very little inroads. This was further compounded by a number of other situations. Firstly, I was offered a better-paid job but needed a vehicle to get there, so I took out a loan to buy one. At the same time my credit card debt was slowly creeping upward too thanks to my minimal income. Initially it all seemed fine. I was earning more each year and the debt I was carrying was covered each month without too much worry. However, over time, as the debt grew thanks to interest charges and mismanagement on my part, the monthly payments started to grow out of control. The final “nail in the coffin” was when I lost my job. Finally that careful financial tightrope I was walking came tumbling down. Over the last few years I’d watched uneasily as my monthly payments ballooned. It was getting to the point that as soon as I got paid, covered my monthly bills and made the required debt repayments my bank account was back to zero again. It really was no way to live; constantly worrying about a surprise bill dropping through the door and how I could handle even the slightest financial emergency. I also had to ask myself if this was where I wanted to be in five or ten years time, as there really seemed no way out. I was trapped in a cycle of low wages and accruing debt, and lost more than a few night’s sleep over my situation. Here in the UK gurus like Dave Ramsey or Suze Orman aren’t too well-known. What I did was just start experimenting to see what worked for me. Personally I believe that getting out of debt is as much about psychology as it is about systems and processes. Just like losing weight, you need to find a plan that you can stick to over the long term. Arguably if I’d known about all the great free advice around at that time I’d have got out of debt sooner, but in the early days it was really a case of trying to figure it out for myself. As I mentioned earlier, the issue I had was that my income and minimum debt repayments were so close to one another that initially I was overwhelmed by the issue. How on earth could I pay off *more* debt, if even servicing the monthly minimums was causing me anguish? The answer is that to solve significant financial problems you need to make some pretty extreme lifestyle changes. They’re certainly not comfortable at first, but I think its really the only way out of such a situation. New Job – The single biggest thing I needed to achieve was a higher level of income. By this point I had a fair amount of experience under my belt so I started looking around for the best-paid position possible – irrespective of working conditions. I ended up landing a job that paid considerably more than any other that I’d done – but that required 55+ hours weeks and anti-social hours. For example I got up at 3.45 am most days to start work. It wasn’t fun, but it was necessary. Extreme Frugality – Next I looked to make cuts to my spending wherever possible. Many personal finance bloggers talk about having a “no spend week” – well basically I had a “no spend” five years! If it wasn’t absolutely critical, I didn’t buy it. That meant no vacations, no new clothes, no eating out, nothing. This immediately let me slash a huge amount off my monthly spending – though of course it wasn’t much fun at the time! Debt Negotiation – I started to wonder whether the money I owed was “fixed” or not. Would my creditors be willing to re-negotiate the outstanding total, or the monthly payments? There was only one way to find out! One by one I went through the difficult and embarrassing process of ringing them each in turn, to discuss the situation, and seek a resolution. While some wouldn’t budge, others were surprisingly relaxed about it. One creditor, for example, agreed lower monthly payments, while another offered to shave a fair amount off what I owed in exchange for a lump-sum payment. Don’t assume the debt you owe is set in stone; being willing to ask can make a big difference! Short Term Wins – Reducing the outstanding debt in exchange for larger upfront payments sounds great – but then you need to find the money for such a deal! To this end I spent time trying to figure out *how* I could get my hands on a significant sum of money in a short space of time (without robbing a bank!). There were a number of things I tried. For example a few friends owed me money, so I pressured them to settle what they owed. I worked hard to get a bonus at work. I also sold off any belongings that weren’t critical. This provided a surprising lump sum in the space of a few months which helped to get the ball rolling. Side Hustles – Lastly, rather than simply sitting back and relaxing in the small amount of time I had off work each week, I instead invested it in a number of side hustles. To be more precise, I started writing on a freelance basis for website owners, and I also launched a handful of blogs myself. My biggest wins for saving money came from psychological tricks I’d employ. That is to say I focused my efforts more on *not* spending money, than on finding ways to buy the same things for less, if that makes sense? In other words – all-out avoidance rather than just reduction. Equate Money To Hours – Before you buy something, consider how much time you’ve had to work to actually buy it. That new pair of jeans might look like a huge bargain as they’re 50% off. That is until you figure out that you just worked an entire morning at your job to buy them. Are those jeans worth it? For me, in most cases, the answer is “no”, so I find it much easier to pass on spending money. Spending Audits Not Budgets – This might be a little controversial, but I tried budgeting and kept on failing. Every month I would divide up my money carefully, and every month I would fail. Instead I took a different route; I started to audit my spending and look for cuts. Here’s how it works. At the end of each month, when I got paid, I would log into my online banking and carefully analyze the last month of spending. I’d record and categorize every expense, looking for potential cuts. Could I lower my cell phone plan? Could I eliminate that software subscription? Could I knock $20 off my grocery shopping somehow? Then I’d make those cuts, and repeat the process next month. Over time I cut my spending more and more, and without having to worry about tracking every penny as I spent it. If You Don’t Need It Now, Don’t Buy It – Retailers are experts at getting us to open up our wallets. There’s always a sale or a promotion going on, and it can be so tempting. I started to ask myself if I’d use the item right then. In other words “do I need it NOW”? That electric drill? It might be cheap, but it’ll sit in my garage for the next few months till I started that project that’s on my mind. So I pass on by. Avoid Shops Like The Plague – The simplest way to save money is just stop going near shops as much as you can! The less you visit, the less temptation there’ll be to spend. Learn to Enjoy The Simple Pleasures in Life – Many of us are busier than ever before. With our jobs, families and social lives its tempting to spend money to enjoy ourselves. To go for a meal out, or grab take-out on the way home. To take the kids to the movies on the weekend. Many of us – myself included – naturally get into the habit of spending money to enjoy ourselves. But it doesn’t have to be that way. Take the time to enjoy a good book (on loan from the library) or go for a hike or bake a meal at home from scratch. Invest time into finding ways to entertain yourself *without* it having to cost the earth. The best reward of all becoming debt free was simply the “feeling”. To suddenly have that weight lifted was an amazing feeling, and one I still relish to this day! Having said all this, I am now a *little* more relaxed about money. I’ve had a few (bargain) vacations away, moved to a slightly nicer property and got out of that awful job I mentioned earlier. In general though, the process of paying off debt has taught me a lot of things, and its a lifestyle I continue to this day. 8. Was there something that you gave up that you will go back to now that you are debt free? Through paying off my debt I have developed quite a frugal outlook on life, and its not something I see myself giving up just yet. While paying off my debt has changed my life immeasurably, I’m now keen to apply these same principles to building a generous “nest-egg” for the future. As a result, while travel is one the horizon in the next few years, building up my savings is the priority right now. 9. What are your financial goals now? Paying off debt and growing savings is a means to an end. That end result is a more comfortable future, with a lifestyle you can enjoy. Right now my primary goal is building up my savings as quickly as possible (and also hopefully buying a house in the next year or two). Beyond that, there are a number of possible options. For example I’ve always dreamt of leaving cold, wet Britain behind and moving to somewhere sunny. I’d love to have a little homestead somewhere, growing most of my own food. The funny thing is that I haven’t totally figured out the future yet. But I don’t think that really matters. Every month my savings go up, and with it, the possibilities for the future. Right now I’m building a strong footing to act as a catapult to a more rosy future; I’ve got plenty of time to decide what that looks like while my savings grow. 10. What advice do you have for someone that is paralyzed by their debt load, but wants to be debt free? “Paralyzed” is a strong word. Equally, that pretty accurately describes how I felt at the time. I’ll be honest; I spent several years “wanting” to pay off debt, but never really getting around to it. It wasn’t until I made it my number one priority that things really started to change. If any readers are ready to really make a change then I think you need to accept that – at least for a while – your lifestyle is probably going to have to change quite dramatically. When you’ve accepted that then the best possible thing you can do is to start as soon as possible, and to go at it with conviction. No half measures or wishy-washy attempts. Question every expense. Increase your income no matter how painful it might seem now. Do the things that your future self will thank you for. 11. Is there anything else you’d like to add that you think would help the readers who want to become debt free? When you’re staring down the barrel of a debt-fuelled life, its all too easy to be overwhelmed – I know I was. How on earth are you ever going to change your financial situation? The funny thing is that here I am just a few years later and I’m done. In other words the reality of paying off debt isn’t as bad as you may first think. Indeed, now my debt is clear I actually look back at the process and wonder what I was ever worried about! I wrote an article about the lessons I learned here but the biggest take-home point is not to fear your debt. The more you ignore it, the worse the problem becomes. Try not to feel overwhelmed. Even if you only take baby steps, you’ll still be heading in the right direction. As the Chinese proverb goes: “a journey of a thousand miles begins with a single step”. Thank you, Richard, for sharing your story. 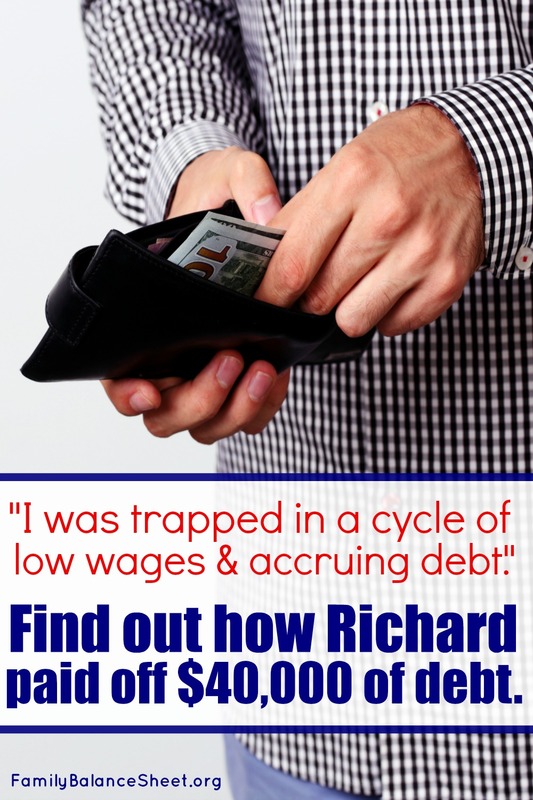 Readers can find out more about Richard at his website, Frugality Magazine. For more stories like his, go to Debt Free Stories. You’re welcome, Richard! Thank you for participating.